ODXStudio was designed for use by all users who work in an ODX-based diagnostic process and view, edit, process or manage diagnostic data in ODX format. It supports the diagnostics development of individual ECUs up to the level of entire vehicle platforms. It is equally well suited for users working at automotive OEMs and those working at suppliers. ODXStudio processes the data of ODX versions 2.0.1 and 2.2.0, each in native format. This makes it easy to implement cross-version reuse of diagnostic data and a migration to “ISO- ODX” (ODX 2.2.0 = ISO 22901-1) for example. Combine multiple independent PDX files into one vehicle PDX. The “Check file” function also checks the current ODX file in the context of the complete project. Many new customer-specific functions, e.g. improvements of the Volkswagen ODX-F perspective. ODXStudio makes it easy for users to create new ODX data based on master projects that already offer a project framework including standard libraries and default settings of values. This significantly reduces initial effort in config-uring new parameters. ODXStudio offers a separate ODX view for each ODX category. This lets users focus on the category that they are currently editing. In addition, other process perspectives can be shown in a category-specific way. In these perspectives, it is possible, for example, to force conformance to authoring guidelines during input. ODX Perspective: For ODX experts, whose task is to examine and edit data elements with all details according to the ODX specification. ECU Perspective: For parameterizing UDS ECUs by simple entry of the supported DIDs and DTCs. It enables the user to parameterize ECU data without ODX knowledge. 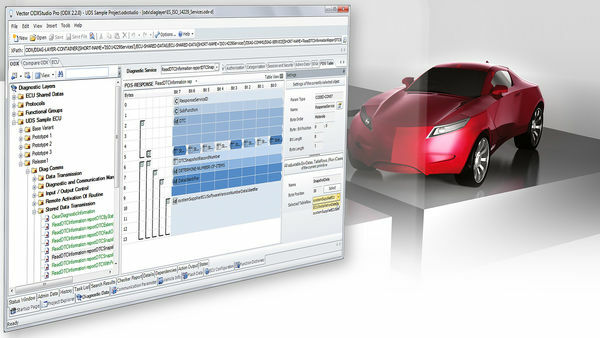 Process Perspective: For ECU developers without well-founded ODX exper-tise. The data is displayed and edited in reduced and process-oriented form. With the integrated roles concept, the visibility of individual perspectives can be preconfigured for specific user groups. Automated check of the data described using the standardized rule set of the integrated ODX Checker. Identifying popular errors in the data by using additional rules. Optionally expandable to your own rules. Can also be used via the command line. The number and complexity of control units used in automobiles has increased tremendously. It is therefore important to include diagnostics in the development process of control units from an early stage. Our training classes and workshops will provide you not only with a basic understanding of diagnostics. Especially with practical exercises you will gain a comprehensive view on the Vector diagnostic tool chain.